RD09-0036 Summary of Clinical Efficacy Data shows 83% Success Rate in reducing Tinnitus 50% or greater! 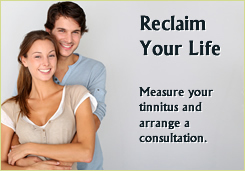 Tinnitus is a condition that affects 17% of the population to varying degrees (American Tinnitus Association). Neuromonics was developed in the mid 1990’s and then approved for use in 2005. 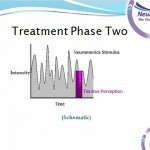 The Neuromonics program works in two phases. The first phase (see image A) involves listening to a specially formulated sound therapy signal made up of music and relaxation tracks. The sound energy of these tracks is modified by an algorithm developed by Neuromonics over many years of research to provide maximum interaction with your tinnitus at the lowest possible volume, thereby significantly reducing the user’s awareness of their tinnitus. Then, as a result of reduced awareness, the user’s negative reaction to their tinnitus is significantly reduced whilst they are listening to therapy. 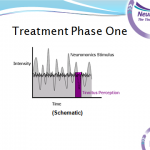 Then in phase 2 (see image B) the persons negative reaction is reduced, the parts of the brain that previously were responsible for increasing the tinnitus sufferers awareness and strong negative reaction to the tinnitus, become desensitized and the tinnitus becomes less noticeable over time. Importantly, research has shown this process of desensitization can take months of regular use. However, clinical trials indicate that 83% of patients have been treated successfully with the full Neuromonics program. Neuromonics, Inc. is a medical device company dedicated to helping people with its treatments for ringing in the ears, clinically known as tinnitus. Neuromonics manufactures and distributes the only FDA-cleared, patented and clinically proven medical devices designed for long-term, significant relief of tinnitus. The company also has received regulatory approval from the Therapeutic Goods Administration (TGA) in Australia. Beginning with the work of Paul Davis, Ph.D., inventor of the Neuromonics Tinnitus Treatment, and research and development since the early 1990s, Neuromonics has helped thousands of tinnitus sufferers around the world improve their quality of life and overcome the daily challenges associated with tinnitus. The company’s global operations are located in Westminster, Colo., in the United States, and in Sydney, Australia. Neuromonics, Inc., manufactures and distributes clinically proven, FDA-cleared medical devices to treat mild, moderate and severe tinnitus. With research and development beginning in the early 1990s, Neuromonics has helped thousands of tinnitus sufferers improve their quality of life and overcome the daily life challenges associated with tinnitus. Following active duty, many military members complain of ringing in the ears. Neuromonics has experienced great success in helping veterans obtain relief from their tinnitus. Through research and awarded grants, Neuromonics has demonstrated effectiveness in its products and services. Each of Neuromonics products fit the Progressive Tinnitus Management protocol that the U.S. Department of Veterans Affairs and Department of Defense utilize. The NTT works with the Neuromonics Oasis, a non-invasive, compact, lightweight device that uses music – programmed for each patient’s individual audiological profile – to deliver a neural stimulus that targets the brain’s auditory pathways. The NTT targets the neurological processes of tinnitus: its audiological, attention-based and emotional aspects.